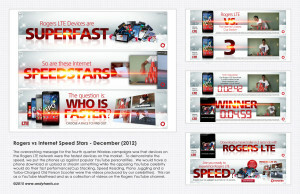 Rogers vs Internet Speed Stars – December (2012) The overarching message for the fourth quarter Wireless campaigns was that devices on the Rogers LTE network were the fastest devices on the market. To demonstrate the speed, we put the phones up against popular YouTube personalities. We would have a phone download or upload or stream something while the opposing YouTube celebrity would do their fast performance(Cup Stacking, Speed Reading, Piano Juggling and a Turbo-Charged Old Person Scooter were the videos produced by our celebrities). This ran as a YouTube Masthead and as a collection of videos on the Rogers YouTube channel.